Demo (best viewed on desktop Safari/Chrome or iPhone/iPod Touch). 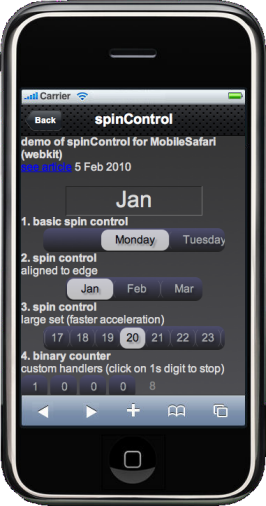 Although the demo uses jQTouch & jQuery, neither is required to run spinControl. Released under MIT licence. Free to use. Spin control with values 0-100 (%). Spin control with values ‘min’ to ‘max’ in increments ’step’. Spin control with text values. Spin control with values 1-10 (step 1) and given options. onspin            : null,        // called while user is sliding or just once if spin programmatically. onchange          : null,        // called once at end of spin if the value has changed. A special case of the spinControl is the toggle switch that behaves similar to iPhone’s on/off switch, which can be toggled by clicking or sliding it. I call it the spinToggle. The onOffStyle flag (if provided), styles the control similar to iPhone’s on/off toggle switch. The second argument should be an array indicating the text for the two states of the switch. The width of the control is adjusted accordingly. See demo link above for example. Subscribe to comments with RSS or TrackBack to 'spinControl'.